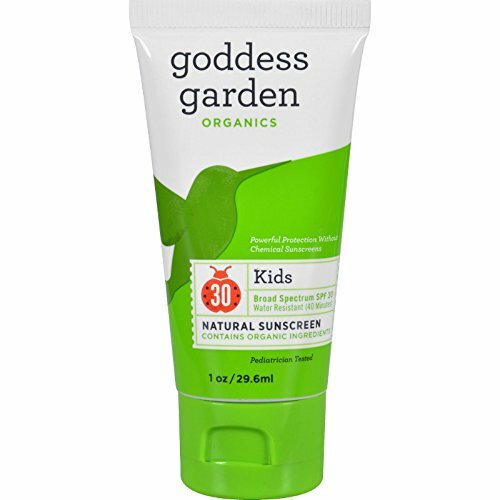 This is the original natural sunscreen our founders made for their daughter-an organic, mineral-only product. Packed with safe, plant-based ingredients, our kids sunscreen will keep you and your family protected from the sun at the beach, in the pool, or enjoying the mountains. Broad spectrum SPF 30 protection will keep you and your children protected from the sun's rays for hours. Easy to apply, non-whitening, and all-natural. Parents will love this sunscreen as much as their kids! Zinc and titanium are used as active ingredients. We never use synthetic chemical sunscreens. This is a certified organic product adhering to NSF/ANSI 305 standards for body care. Strong water resistance rated to 40 minutes. Please recycle this number 5 container. Non-Nano, Reef Safe, Non-GMO, Biodegradable, Vegan, Cruelty Free, Alcohol Free, Paraben and Phthalate Free, and Free from Gluten Ingredients. If you have any questions about this product by Goddess Garden, contact us by completing and submitting the form below. If you are looking for a specif part number, please include it with your message.